It’s almost Easter, and Spring is in the air! All of creation is starting to wake up again from its winter slumber; the flowers, trees, and birds are blooming and bustling with energy. When you think about it, what an amazing time to celebrate the death and resurrection of our Savior! What a great reminder that because of Jesus, we too can rise and have new life. Let us not forget during this season that it is all about Jesus. During our Easter celebrations, our egg hunts, our crafting, and all the food, desserts, and candy, let’s be women who teach those around us the true meaning of this holiday and the importance of Christ in our lives. And what better way to really talk and teach your children, then to spend quality time with them. Here are some fun and kid-friendly Easter projects for you to try out. Just click on the picture to get the instructions. Also, all are found on our “Kiddo Time” Board on the Long Hollow Women Pinterest page. Enjoy! 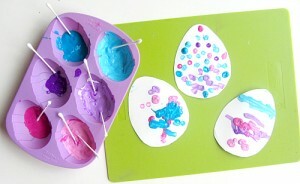 Q-Tip Painted Easter Eggs: These are great for teaching tinting and color-mixing, as well as working on fine-motor skills. 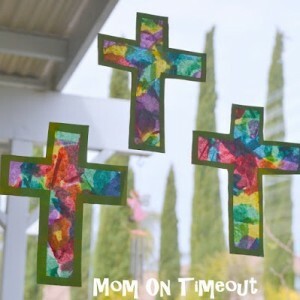 Stained Glass Crosses for the window. 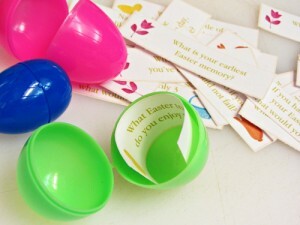 Conversation Eggs: In need of some conversation starters at your Easter dinner? Check out this cute idea! Chalkboard Eggs: Instead of dying eggs, why not paint them? 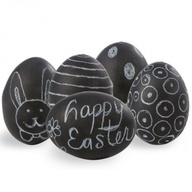 You can use traditional permanent markers to paint white eggs, or try dying the whole thing in chalkboard paint first. 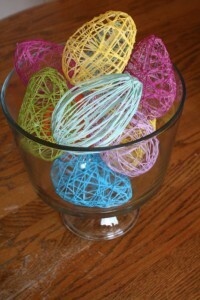 Yarn Easter Eggs: This may be a craft that is better for elementary aged children. Again, remember that all these ideas and more can be found out our Long Hollow Women Pinterest page. Click here to view it!